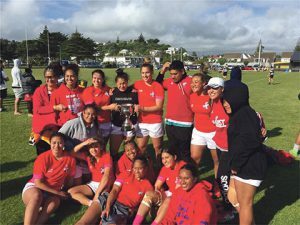 WelCom December 2017: Marist St Pat’s Women’s Sevens has won the women’s competition in the annual Ambassador’s Sevens series, taking home the Eleanor Roosevelt Trophy. A win over Northern United in the final of the second leg of the series meant the side went unbeaten in the series to claim the title of Wellington club rugby’s best Women’s Sevens side. The team was formed three years ago and winning Wellington’s biggest Sevens prize was a ‘tick’ on their goals’ list. Coach Setefano Ryan said the cup wins over the last two tournaments came down to the preparation and dedication the girls have shown in the build up to this year’s season. ‘They set a goal to win the Ambassador’s Cup this year, put some hard yards in and the rest is in the history books now. They deserve it!’ he said. Source: MSP RFC newsletter, Red Machine, No. 7, November 2017.